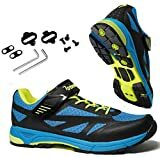 Does it matter which shoes I wear for cycling? What shoes are best for competing in a triathlon? If you enjoy cycling to work or journeying across the country during the holidays, you will recognize the need to purchase the correct cycling equipment. You will, of course, purchase your cycling helmet and your high-vis equipment and safety reflectors, and maybe some performance-enhancing clothes. Although, you may not have considered purchasing bike shoes, assuming that standard leisure shoes will suffice perfectly. You would be incorrect in this notion, however, because when cycling it is quite common for your feet to slip from the pedals, hindering your performance and perhaps even placing you inside a degree of danger. Bike shoes encompass all of the benefits of modern running shoes beginning with the breathable mesh material, to the secure fastening, through to the possibility of the removable sock liner. Additionally, bike shoes also feature rigid soles to maintain their position within the pedals, featuring compatibility with cleats and increasing your potential cycling performance. 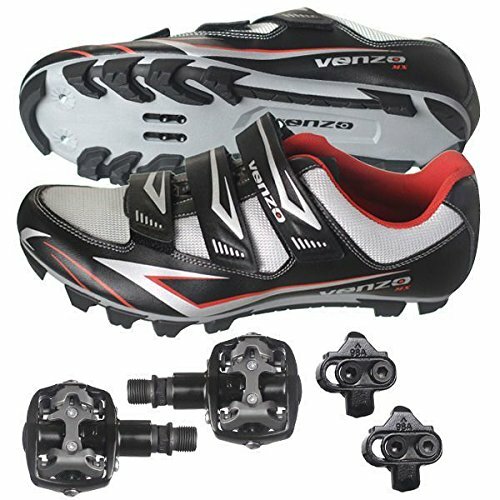 The Venzo Mountain Bike Shoes provide effective cycling shoes between size US Men 6.5 through to US Men 11, offering a shoe and pedal combination. Featuring award-winning technology and a high level of performance, the bike shoes are flexible across the forefront while providing a beveled heel and enable riding with cleats or without cleats. The bike shoe comes complete with a removable sock liner and a textile interior, ensuring that your feet stay fresh, dry and clean every day. The low-cut construction of the bike shoe enables a light feel and a fast fit, providing compatibility with all Shimano SPD pedal systems. 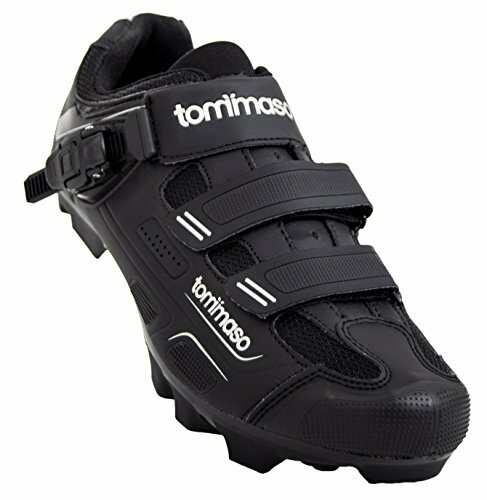 The typical weight of the bike shoe is 22.5 oz, and they are available in a striking black and white design. Why We Liked It – The Venzo Mountain Bike Shoe provides a shoe and bike combination not always offered with a bike shoe. Additionally, the removable sock liner is a great feature, ensuring that your feet stay fresh and healthy, particularly after a tough day cycling. The Tommaso Montagna 200 Men’s Mountain Bike Shoes provide a fiberglass reinforced sole to ensure optimal stiffness and the maximum level of power transfer. This unique technology empowers the rider and allows you to ride longer and faster while conserving your energy. Made from durable synthetic leather across the upper shoe, these bike shoes embrace your feet, providing effective ventilation through the mesh material so that your feet can fully breathe. 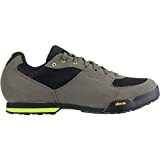 Higher performance and comfort achieved with this bike shoe, featuring a precision buckle across the top of the shoe in addition to Velcro straps, ensuring that your feet are comfortable with every step. Furthermore, you can rest assured that this is a safe purchase, experiencing 100% fit guarantee in addition to 100% free fit returns. Sizes are available from US Men 7 to US Men 11. Why We Liked It – The precision buckle and the Velcro straps ensure that the Tommaso Montagna 200 Men’s Mountain Bike Shoes are a perfect and comfortable fit for your feet, providing high-performance capability while cycling. You might be interested in Mountain Bike Lights. The Diamondback Men’s Trace Clipless Pedal Shoes offer a suede body along with mesh ventilation across the upper, providing a perfect combination for a high-performance shoe. Featuring a rubber outsole, pedaling efficiency is enhanced through the fiberglass reinforced nylon mid-sole. Additionally, the reinforced toe and heel cup ensure the highest level of durability, perfect for mountain biking, indoor cycling and touring. Providing a Velcro lace keeper across the top of the shoe, your laces are safely kept out of the way. 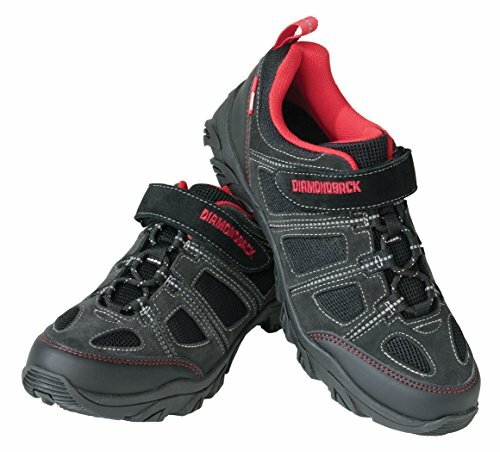 The Diamondback Men’s Trace Clipless Pedal Shoe is available in sizes US Men 6 through to US Men 13.5. Why We Liked It – The Diamondback Men’s Trace Clipless Pedal Shoes provide a Velcro lace keeper which is a great feature and a perfect safety addition. Furthermore, the reinforced toe and heel cup provide a durable shoe for the tough cycle and is additionally a great bike shoe for indoor riding. Featuring a two bolt cleat, the Gavin MTB Mountain Bike Mesh Shoes are compatible with SPD in addition to MTB pedals and Crank Brothers. Providing a perforated insole which is comfortable and particularly lightweight, its quick-drying action enables your feet to stay fresh, clean and healthy. The carbon fiber designed hook and loop straps offer additional stability, which is enhanced by the heel cup, securing your feet and providing the high-performance capability. The lightweight and cool shoe are perfect for all of your cycling needs while providing key freedom within ankle movement due to the included notch in the tongue. The sizes available begin at US Men 7.5 through to US Men 13. 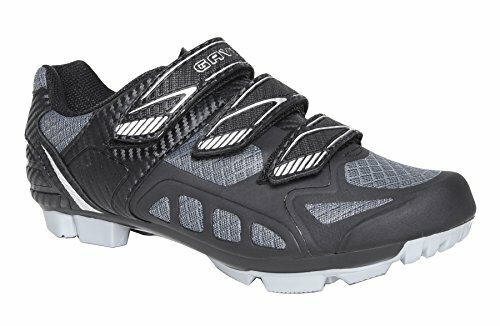 Why We Liked It – If you are looking for a lightweight and cooling bike shoes, then the Gavin MTB Mountain Bike Mesh Shoe could be the product for you. Securing your feet with the additional and thoughtful features, you are assured high performance from your cycle. 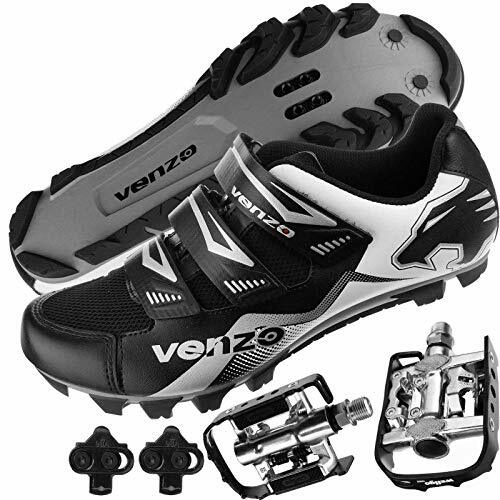 The Venzo Mountain Bike Shoes feature award-winning technology for your optimum performance. The synthetic mesh which envelopes the upper shoe provides a breathable relief for your feet, offering a fast drying fabric which helps to maintain dry and fresh feet. The interior lining of the shoe is made from a comfortable textile in addition to a removable sock liner, ensuring hygiene and healthy feet. The low-cut construction of the shoe provides a light feel yet a fast fit, offering an emphasis on the flexible forefront in addition to the beveled heel. Compatibility is apparent in collaboration with all Shimano SPD pedal systems. The average weight of the Venzo Mountain Bike Shoe is 22.5 oz, with sizes being available from US Men 6.5 through to US Men 11. The Zol Predator MTB Mountain Bike Shoes provide two bolt cleat compatibility for Crank Brothers, SPD, and MTB shoe pedals. Features include a three carbon fiber Velcro straps which ensure that your feet are secure and comfortable while the carbon fiber heel cup provides stability throughout your feet. The mesh leather front ensures that the shoes are comfortable in addition to feeling lightweight, enabling freedom around the ankle with the inclusion of the tongue center separation. The nylon sole is manufactured with double injection fiberglass, providing a rigid shoe for the pedals yet maintains comfort throughout your cycle. Perforation within the insole drains water and sweat away from your feet, enabling you to cycle as hard as you can whatever the weather. This lightweight bike shoe weighs around 12.4 oz and is perfect for both mountain biking and indoor cycling. 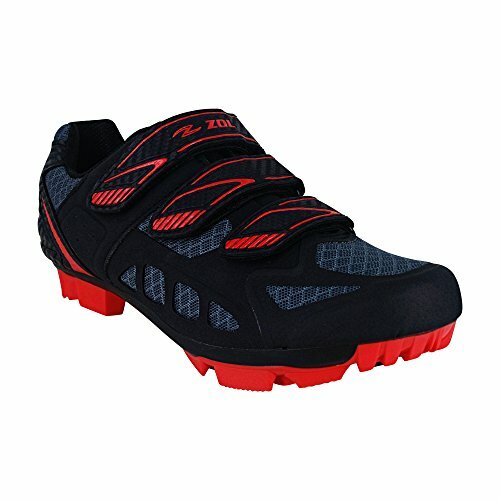 Why We Liked It – The Zol Predator MTB Mountain Bike Shoes is a great purchase, considering every possible requirement for a perfect bike shoe. The perforated insole provides air to the feet, draining away sweat and water to keep your skin in great condition. The double injection fiberglass sole provides the rigid feel required in bike shoes, yet ensures comfort is at the optimum level. Furthermore, your feet are secured with three Velcro straps in addition to the carbon fiber heel cup, ensuring that your feet do not slip inside of the shoes. 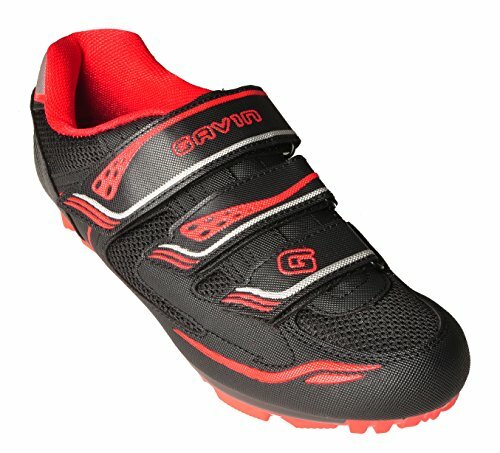 The Gavin Off-Road Mountain Cycling Shoes offer a black color choice with a striking red sole and red interior, providing a unique style of bike shoes. Features include full compatibility with SPD cleats in addition to a secure enclosure due to the hook and loop straps. Providing breathable mesh across the upper shoe, your feet are able to stay dry and clean while odors are eliminated while the synthetic microfibre leather offers a tough and durable surface. The Gavin Off-Road Mountain Cycling Shoes are lightweight and feel cool during the journey, while the nylon fiberglass sole is rigid and ensures resistance against flex for power transfers. Why We Liked It – The Gavin Off-Road Mountain Cycling Shoes is a great performing, lightweight bike shoe which provides a rigid sole and a breathable upper shoe. The black color design with the red flashes across the sole and the interior additionally make these bike shoes a strong purchase. A mountain bike shoe is certainly an understated piece of any cyclist’s equipment, yet a tool which performs an important role within the sport. A rigid sole ensures that sufficient power is transferred to each pedal while a strong shoe and a secure fit fully protect your feet and ensure that comfort is paramount. Whichever type of mountain bike shoes you decide to purchase, it is vital that you try before you buy, checking the fit, the fastening, and the kind of sole to ensure that your feet are comfortable and that your cycling performance will benefit. The fastenings included within your mountain bike shoes are very important, ensuring that your feet are secure within the shoes and that your feet cannot slip. Many mountain bike shoes contain Velcro fastenings, providing a cheaper yet efficient option. Velcro straps hold the feet in place although adjusting the fit can be tricky and so you may have to compromise to achieve the perfect fit. Velcro straps are light and can help enhance a lightweight mountain bike shoe greatly. Some mountain bike shoes may contain ratchets, providing additional adjustability to that of Velcro straps and offering a secure fit for your feet. A benefit of your mountain bike shoes containing a ratchet fastening is that you can adjust your bike shoes while cycling, ensuring that your ride is uninterrupted and that your performance is at your optimum. However, a ratchet fastening is quite difficult to loosen. Another type of fastening is the dial fastening system, which may feature predominantly on the high-end mountain bike shoe. A dial fastening offers a secure fit which is also easy to adjust and hold the feet. A Boa dial may provide the best quality of adjustments, and therefore may ensure that the highest performance is attained. Marginal gains laces are an additional type of fastening, providing comfort on the go, although offering less practicality as you cannot adjust the laces while cycling. Different types of shoe sole are additionally important for cyclists, with an emphasis on stiff soles being the desired variation in order to achieve high performance. When a stiff sole is pressed down onto the pedal, the sole will remain rigid and will not bend, transferring power from the sole to the pedal. A lighter sole is another quality which benefits your ride, with the lightest soles joining the most expensive mountain bike shoes. Cheaper or beginner soles may be made from plastic with the most expensive mountain bike shoes consisting of carbon composite soles or carbon-soled shoes. The types of cleats which will join your bike shoes include two-bolt cleats and three-bolt cleats. Two-bolt cleats are perfect for riding off-road, being compatible with Shimano SPDs as well as Crank Brothers. Riding across roads will require you to use three-bolt clears, providing a wider platform and increasing the power transfer across each pedal. If you are a competitive cyclist and have more money to spend, you may consider purchasing customized heat molding mountain bike shoes to find the best fit for your fit and your needs. The arch of your feet will be supported, ensuring that the power transfer is at it’s optimum and that your comfort is paramount. This could be the perfect solution for individuals with flat feet or those with arch-related issues. Before purchasing your mountain bike shoes, consider how you will be using them and what weather conditions you will most likely be riding in. If you are a beginner or want to ride leisurely or for short commutes to work, waterproof winter cycling shoes may be the best choice for your needs. Alternatively, if you are considering competing or time racing, performance cycling shoes should be the best choice, providing a carbon sole to ensure a strong power transfer. A: Yes, if you are serious about riding. Of course, any pair of shoes will enable you to ride a bike. But if your shoes fit poorly, then your feet may slip as you ride, and your feet may slip away from the pedal if the soles are soft. Buying a pair of bike shoes will ensure that your feet fit perfectly and that the soles are rigid enough to provide the needed power transfer to the pedals. A: If you compete in a triathlon then you will need specific tri-shoes. Tri-shoes enable you to put them on and off as you cycle, offering a loop on the heel so that you can change footwear when required. Tri-shoes will include drainage holes for when your feet are wet. Ensure that you check with your retailer to see which exact pair of shoes will benefit you.